FIG. 5. Comparison of direct-repeat sequences consisting of 61 base pairs in the 3′-end flanking region of iap. The 29 highly conserved nucleotides, which contain a dyad symmetry of 14 base pairs (underlined), are shown at the bottom. Homologous nucleotides found in at least two DNA segments are shown in boldface type. The second translational termination codon is boxed. The nucleotide numbers are in parentheses. An unusual structure was found in the 3′-end flanking region of iap (Fig. 5). Five highly homologous sequences of 29 nucleotides were arranged as direct repeats with 32 nucleotides as spacing. The first sequence was included in the putative transcriptional termination site and had less homology than the others. Well-conserved nucleotide sequences containing a dyad symmetry, named REP sequences, have been found in E. coli and Salmonella typhimurium (28) and may act to stabilize mRNA (18). A dyad symmetry with 14 nucleotide pairs was also found in the middle of these sequences (underlining, Fig. 5), but no homology was found between these sequences and the REP sequence. So far, no sequence homologous to these has been found elsewhere in procaryotes, and the biological significance of these sequences is not known. CRISPR provides acquired resistance against viruses in prokaryotes. Barrangou R, Fremaux C, Deveau H, Richards M, Boyaval P, Moineau S, Romero DA, Horvath P. Science 2007 Mar 23;315(5819):1709-12. Jinek M, Chylinski K, Fonfara I, Hauer M, Doudna JA, Charpentier E. Science. 2012 Aug 17;337(6096):816-21. Zhang studied chemistry and physics at Harvard and graduated with the highest honors. He then headed to Stanford University for his doctoral work, where he joined the newly formed lab of Karl Deisseroth, who had just begun to develop optogenetics as a method for manipulating brain activity. Over the next five years, Zhang played a central role in making optogenetics a reality. In 2009, after earning a PhD in chemistry, Zhang switched his focus to genome editing. That same year, he received a prestigious three-year Harvard Junior Fellowship, during which he worked in the laboratories of two Harvard Medical School professors, Paola Arlotta and George Church. There, he helped develop a new method of gene editing through the adaptation of TAL effectors (TALEs), sequence-specific DNA-binding proteins found in plant pathogens that alter gene expression in plants. Volume 163, Issue 3, 22 October 2015, Pages 759-771. Here, we report characterization of Cpf1, a putative class 2 CRISPR effector. We demonstrate that Cpf1 mediates robust DNA interference with features distinct from Cas9. Cpf1 is a single RNA-guided endonuclease lacking tracrRNA, and it utilizes a T-rich protospacer-adjacent motif. Moreover, Cpf1 cleaves DNA via a staggered DNA double-stranded break. Expanding the catalog of cas genes with metagenomes. Quan Zhang, Thomas G. Doak, and Yuzhen Ye. Nucleic Acids Res. 2014 Feb; 42(4): 2448–2459. CRISPR/Cascade 9-Mediated Genome Editing-Challenges and Opportunities. Bhaskar Roy, Jing Zhao, Chao Yang, Wen Luo, Teng Xiong, Yong Li, Xiaodong Fang, Guanjun Gao, Chabungbam O. Singh, Lise Madsen, Yong Zhou, and Karsten Kristiansen. Front Genet. 2018; 9: 240. A programmable dual-RNA-guided DNA endonuclease in adaptive bacterial immunity. Jinek M, Chylinski K, Fonfara I, Hauer M, Doudna JA, Charpentier E. Science 2012 Aug 17;337(6096):816-21. C2c2 is a single-component programmable RNA-guided RNA-targeting CRISPR effector. Omar O. Abudayyeh, Jonathan S. Gootenberg, Silvana Konermann, Julia Joung, Ian M. Slaymaker, David B.T. Cox, Sergey Shmakov, Kira S. Makarova, Ekaterina Semenova, Leonid Minakhin, Konstantin Severinov, Aviv Regev, Eric S. Lander, Eugene V. Koonin, Feng Zhang. Science 02 Jun 2016. 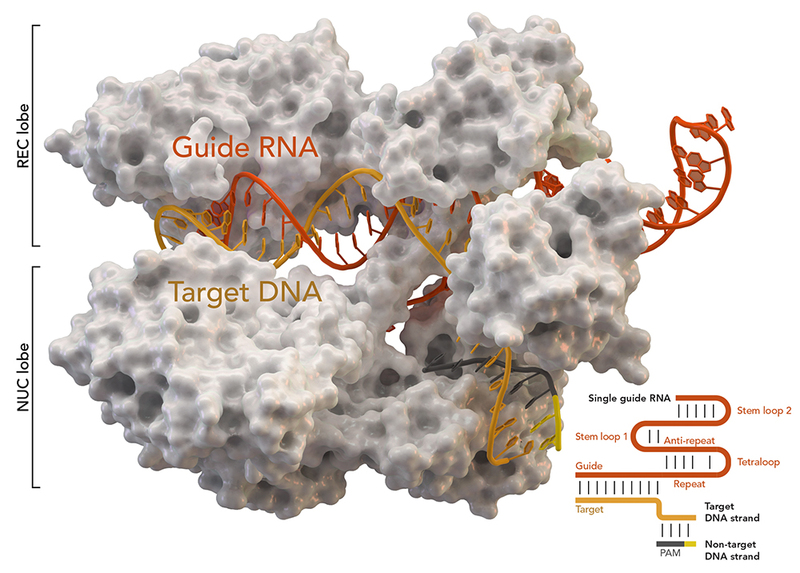 Protospacer adjacent motif (PAM)-distal sequences engage CRISPR Cas9 DNA target cleavage. Cencic R, Miura H, Malina A, Robert F, Ethier S, Schmeing TM, Dostie J, Pelletier J. PLoS One. 2014 Oct 2;9(10):e109213.